TFE Hotels’ Adina Apartment Hotel Coogee has unveiled a new look following a multimillion-dollar refurbishment. 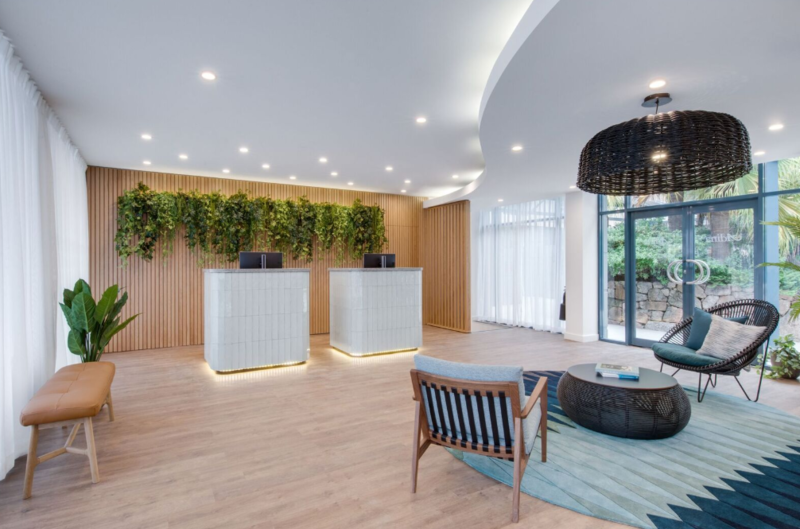 TFE Hotels’ Adina Apartment Hotel Coogee has unveiled a stunning new look following a multimillion-dollar refurbishment. Combining the iconic surrounds and relaxed lifestyle of Sydney’s Eastern beaches with the convenience of the nearby-CBD, Adina Apartment Hotel Coogee’s recent refresh promises to offer an idyllic coastal escape to business and leisure guests from 2019 and beyond. The hotel has been refreshed under the management of Toga Far East (TFE) Hotels, driven by the mission to offer homely comfort to modern explorers in spaces that fuse elegant architecture and contemporary Australian design. A collaboration between D’Cruz and TFE’s in-house design team, the vision for Adina Coogee’s spectacular refurbishment was to elevate its unique beachfront location. An idyllic 200m stroll from Coogee Beach, the hotel offers 86 newly renovated spacious studios, one, and two-bedroom apartments boasting free WiFi, a fully equipped kitchen, and laundry facilities. Adina Coogee’s lobby and conference rooms have also been transformed into a stylish paradise through a stunning colour palette of earthy tones, with greys and caramel, and teal and navy accents. The sophisticated and inviting reception evokes a sense of place through the displayed aerial photography of Coogee beach by local photographers WeThree. A modernised gym, pool and hidden courtyard garden area inspired by the local environment further offer an oasis from the bustling beach and Sydney city just 10 km away. Surrounded by Coogee’s top eateries and a short drive from Sydney Airport, the refurbishment of Adina Apartment Hotel Coogee has positioned it as one of the most desirable places to stay in the Eastern suburbs. Click here to view the Adina Hotels website.